In this book, in which definitions and examples of abuse from men and women from every continent and a very diverse set of backgrounds are considered. The volume provides information on the extent to which family violence is a recognized problem in each country, research findings available on different forms of family violence, and information on governmental responses to family violence. Finally, the value of an international human rights approach to abuse and violence in families is considered. The book presents an unparalleled international coverage, addressing all forms of family violence in Australia and at least two countries from every other continent. 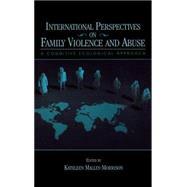 Each chapter begins by describing the cultural context in which family violence and abuse take place. These sections emphasize the role of women and children in the country. Providing a multitude of voices, each chapter includes fascinating and often dramatic definitions and examples of abuse from ordinary citizens of the country. The concluding chapter elaborates on the appropriateness of a human rights approach in addressing family violence cross-nationally and cross-culturally; and provides an excellent integration of much of the material from the previous chapters. The book is intended for advanced undergraduates and graduate students in psychology and sociology, as well as pre-professionals and professionals in medicine, law, and social services. It has strong relevance and value to individuals training in counseling (counselor education) and clinical psychology. Because of its readable style and extensive use of quotations from citizens of the countries studied for the book, it may also appeal to a much broader audience, including a lay audience. Kathleen Malley-Morrison completed a two year post-doctoral fellowship in 1979-1981 at the family violence unit at Children's Hospital in Boston, under the direction of Eli H. Newberger, M.D., and continued as a member of that group for several years after completion of the post-doc. Her original research focus was on intergenerational family relationships in normal, well-functioning families; however, the amount of aggression reported in these "normal, well-functioning families" led to an interest in family violence and she has been heavily involved in teaching about and doing research on family violence ever since. Malley-Morrison has published several books, chapters, and research articles dealing with family violence, and presents the research regularly at professional conferences. She was first author (with Eli H. Newberger, R. Bourne, and J. Snyder) of Treating Child Abuse and Family Violence in Hospitals and first author (with Denise Hines) of Family Violence in a Cultural Perspective: Defining, Understanding, and Combating Abuse. She has been particularly interested in cross-cultural perspectives on abuse and has conducted extensive international research.